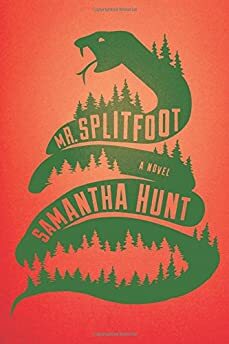 Largehearted Boy: Book Notes - Samantha Hunt "Mr. Splitfoot"
Book Notes - Samantha Hunt "Mr. Splitfoot"
Samantha Hunt's Mr. Splitfoot is a lyrical and thrilling literary Gothic novel, one that truly haunts you. "A truly fantastic novel in which the blurring of natural and supernatural creates a stirring, visceral conclusion." Carl Sagan and Ann Druyan chose this song as one of twenty-seven musical pieces sent into outer space aboard the twin Voyager missions. The Golden Records (along with devices for playing the records) are still traveling away from the Earth, away from each other. That's one metaphor I couldn't resist. There's a version of the Golden Records in Mr. Splitfoot, the Golden Records and twin voyagers as twisted by a religious cult. The title of Johnson's song is derived from “Gethsemane” a 1792 hymn. Dark was the night, cold was the ground on which my Lord was laid. This hymn was popular among 19th century fasola or shape note singers and, nodding to this history, Johnson's vocals absent any preacher. His is a response without the call. He moans his way through the song, never forming words, lining out that cold ground and the loneliness of a blind, black guitarist who used a knife for slide. Many STRANGE things have happened. One of the characters in Mr. Splitfoot has a nasty scar on her face. Her mother burned her with bleach as a baby. When I choose Dark Was the Night for the book, I had no idea that one theory of Blind Willie Johnson's blindness is that his stepmom, after a bad beating from Johnson's father, blinded the boy by throwing lye at his face. I suffer from apophenia, finding patterns in unrelated events. But it is also true that weird things happen everyday. In 1969 the British folk band Fairport Convention recorded "The Lord Is in this Place...How Dreadful Is this Place," a song inspired by Johnson's song and equally populated with ghosts. One hears footsteps down a hallway, items dropped on the ground, Sandy Denny's haunted humming. A nineteen-year-old Richard Thompson plays guitar on this track. This is strange because his once-wife, Linda Thompson is nearly ground zero for Mr. Splitfoot. And "The Lord Is in this Place...How Dreadful Is this Place" could easily be a title to this book though I'd never even heard of this song until after Mr. Splitfoot was done. That brings me to Linda Thompson. It's sometimes hard to remember where the germ of a book starts but an obsession with Linda Thompson was there from the very beginning. Many people already know the story of how Richard and Linda Thompson split up, how their marriage was ending just as their finest album was released, just as Linda gave birth to their third child. After years spent building a family and a band together, after dragging Linda into a religion where women were shunted off to the kitchen, Richard fell in love with somebody else. But here was their new record. The two were sent out on tour together and every night Linda took the stage with a man who was ripping her heart out. There are stories of violence and rage. Understandably. People say she sang more beautifully than ever on that tour. Then, when it was done, Linda Thompson lost her voice for years. My great grandmother Ada also lost her voice so I've always collected stories of silent women, silent mothers. I made my character Ruth with these silent women in mind. This idea haunts me. Where do women's lost voices go? Into some Bluebeard's closet? What does it mean to be silent? One summer our mother sent us to Bible Study Camp though she's not a believer. I think she was more attracted to the idea of free child care. I can kind of understand that. My siblings and I learned this song at Bible Study Camp. We loved it. We'd scream out the lyrics because they were crazy: I've got the far out faith that freaks out farmers down in my heart! And if the Devil doesn't like it he can sit on a tack! The man who taught us that song looked like the devil, or at least he looked like Ichabod Crane, skinny as death, black hair, white skin, horrid teeth and a priest's collar. In Mr. Splitfoot I wanted to capture just how freaky religion looks to a kid. This song helped me remember. This was one of the first records I ever owned because I cut it from the back of a box of Honeycombs. It was a Halloween promotion. With your cereal you got one of three ghost stories. A record, a square, cardboard record. Beautiful. I still have my original and even bought an extra copy on ebay. Nostalgia for the original wounds, the first obsessions. The spooky illustration behind the track shows a man with long white hair, a full moon, an open grave. As a girl, I could not look away from this image. On the record, Wade Denning tells the terrifying tale of “The Hitchhiker.” But there's more than terror in this tale. It's extremely complex, dealing with concepts of home, acts of continued human kindness and the sometimes unbreakable bonds between mothers and their daughters. I retell “The Hitchhiker” more than once in Mr. Splitfoot. The BeeGees make me feel like I'm eight longing to be twenty-one. I always wanted to be as dramatic and messed up as my parents and their friends. If only I were older, I too could go to the disco and wind up completely devastated/broken hearted/hungover the following morning. In Mr. Splitfoot, the children feel a dire necessity to swiftly become adults since the adults are doing a very poor job caring for the children. In my math, BeeGees = Adults, a category I always felt left out of, and now, with Maurice and Robin gone, their pure sibling, beauty music continues to make me feel the grief of one left behind. I love the BeeGees. For years I sang karaoke at least one or two nights a week at Hope in Anchor in Red Hook, Brooklyn. It was a magical time as all the regulars from those sainted years recall. Drag kings and queens, pregnant ladies, dock workers, editors and waitresses jammed in that tiny club, singing by the light of the revolving cake case. There was one man, a bearded fellow, maybe he was a hippie though he seemed more complicated than that. I couldn't talk to him because I had a crush on his voice. I think he might have been Louisa's boyfriend for a little bit. Except wasn't her boyfriend in prison? Anyway, he'd sit quiet all night, listening to everyone else sing and show off. He was shy. He sipped his beer. Then late at night, when all but the most addicted crooners had gone to bed, he'd take the mic and sing in a voice no one would ever suspect from that large, bearded barrel, a voice like a choirboy, like an angel, he'd sing “O Holy Night” and it was never anywhere near Christmas. In fact, by the time he was done, the song had nothing to do with the holidays. It was all about fall on your knees and listen to the night. It was the passion, the suffering, the mystery. I'll never forget it. Some songs make me wish I could participate more in organized religion. This is one of them. Sung by him. Yes. He'd do “O Holy Night.” Or, every now and then “One More Try” by George Michaels.